Please enter the first name details in the box. Up to a maximum of 10 characters. If not required please enter the word No before proceeding with your purchase. Thank you. A lovely warm wool crochet baby blanket, suitable for snuggling baby, toddler, child and bear lovers. A delightful unique design of Paddington Bear carrying a suitcase for his journey. As well as the practical uses of this toddler blanket, of which are plenty, this trendy blanket is a must have gift. It is so cute and needs a good home to go to ! Would you like it personalised ? Please send the recipients first name details in the box when ordering. The name will be stitched onto a small knitted luggage label in keeping with the paddington bear theme. # Size 33 x 42 inches or 83.82 x 106.68 cm approx. Due to natural movement in the yarn the measurement may vary. # Handmade using premium acrylic wool in white, blue and lemon. The design and borders are knit and crochet using 100% cotton. # Care instructions - 40 degrees machine washable and a low heat tumble dry. # Your blanket will be beautifully packaged in tissue paper and boxed. 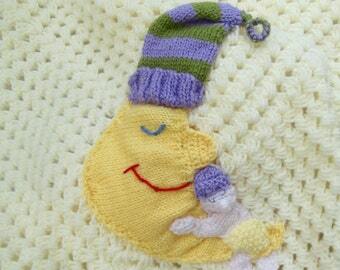 # All of my crochet baby blankets are posted using first class, tracked and signed for postage. 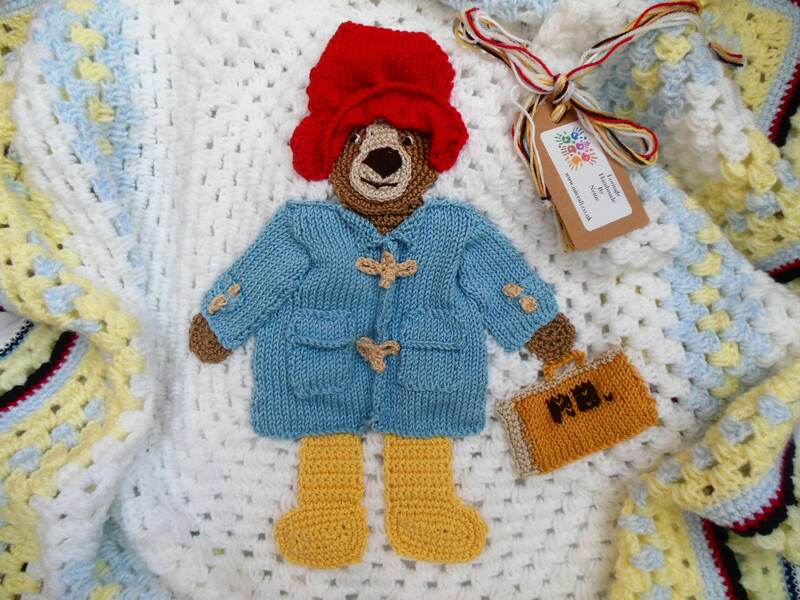 The Nitcraft Paddington Bear crochet blanket is not a licensed product and I am not affiliated with the Paddington Bear brand in any way. I have not used a pattern in the making of this themed product. This lovely crochet baby blanket has been both designed and hand crocheted by myself, in a clean, smoke free environment with a lot of attention to detail. The design has been carefully appliqued to the front of the afghan and is not visible on the reverse side. or to enter my shop. Gift wrap floral or stripes & hand written gift card with your personal message. Very Beautiful, my wife loves it. Payment accepted is by all major credit and debit card's, plus Paypal. Custom orders must be paid for in advance of order being made. I feel sure you will be delighted with your purchase but in the unlikely event that you are unhappy, I am happy to refund upon my receipt of the returned item. The refund would include the shipping cost. The customer will be responsible for the return shipping costs. The customer will be refunded upon my receipt of the returned item in the condition it was originally posted in. Items will be posted within the time frame shown on of receipt of payment. (unless custom made to order) and I will retain proof of posting. Please note I am unable to post on Saturdays, Sundays, UK Public Holidays or due to unexpected events such as postal strikes. Please note that I cannot be held responsible for delays once the package has gone into the postal system e.g postal strike or busy Christmas period when delivery is always slower. For custom made orders I will give you a time frame of completing the order and dispatching at the time of ordering. Most of my items are sent via Royal Mail second class and also overseas Airmail via Royal Mail. Should you wish to upgrade to a tracking service please contact me before purchasing as it will incur revised postal charges. All of my blankets over £50.00 are sent with tracking and signed for first class postage. Please note that orders placed outside of the E.U may be liable for duty/import taxes on delivery, this is completely out of my control as are any delays in delivery due to customs interventions. Payment of such customs amounts are the responsibility of the person the package is addressed to. Please note that shipping outside of the U.K may take longer, up to as much as 6 weeks. Normally it can be very quick 2-3 working days UK/ Europe 3-7 working days. To the US/ Canada, Australia / New Zealand /Japan etc up to 3 weeks. If you have not received your order within 25 days please contact me so I can start the claims process. I can not be held responsible for undelivered packages due to discrepancies in Etsy delivery addresses. If you need the item delivered to a different address to your Etsy address please let me know by Etsy conversation. I am happy to make a custom order blanket for you. Please contact me via conversations with your requirements before placing your order and we can take it from there. If the item purchased has an option to be customised with first name or initial, please enter name or initial details during the order process in the notes to seller area. All of my items are handmade and the measurements given are are approximate. All of my knit and crochet creations are machine washable on a 40 degree wash cycle. For best results air dry naturally, if tumble dried on a cool setting. The premium wool and cotton that I use hold their colour beautifully, wash after wash.
All of my blankets are beautifully packaged with tissue paper and placed in a box ready for presentation. 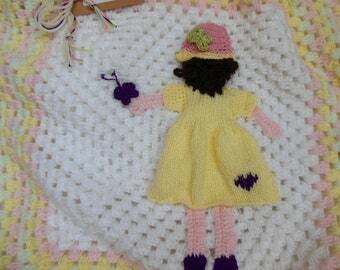 I also include a lovely little keepsake for the new mother with each purchase. A little something for her to treasure. Items that are not boxed will be in tissue paper and an alternative such as clear cellophane dependent on the size. There is no extra charge for this service. There is gift wrap option for each of your purchases for an additional charge should you require any of your purchases gift wrapped with paper and a hand written gift tag. Please note that should the wrapping be damaged due to customs opening the item I will not be held responsible.